...like having a bank at home. Nothing raises the perceived value of a custom home like a walk-in security room. It makes owners feel like they have a bank at home at a minimal investment. 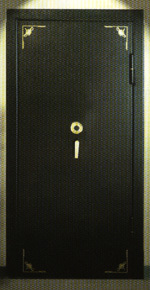 As a contractor, you can get a full-height, 36-inch vault door, framed and ready to install for about the same price as a good exterior door. Internal safety latch -- you can't get locked in!